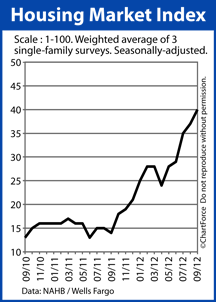 Home builder confidence continues to make new highs. As reported by the National Association of Home Builders, the Housing Market Index, a measure of builder confidence, rose to a reading of 40 in September — its highest mark since June 2006. The index is now higher through five straight months and 11 of the last 12. For home buyers in Brentwood , the survey may be signaling higher new home prices ahead; when builders are more confident in housing, they’re may be less likely to make concessions in price, and to “sweeten” deals with free upgrades and/or subsidized mortgage rates. The Housing Market Index is published monthly, based on responses to a 3-question survey that the NAHB sends to its members. The questions cover three distinct parts of a builder’s business, each requiring a simple, one-word answer. All three survey components showed an increase from August with buyer foot traffic rating at its highest point in more than 6 years. This is especially noteworthy because as the number of prospective buyers increases, so does competition for homes for sale. There are currently just 142,000 new homes for sale nationwide, the stock of which will “sell out” in 4.6 months at the current pace of sales. Not since October 2011 has the national home supply been above six months, the consensus dividing line between bull and bear market. Today’s new construction market favors builders and builders know it. If you’re planning to buy new construction in Tennessee later this year or into early-2013, consider moving up your time frame. Homes may be for sale, but they won’t likely be as inexpensive as they are today.